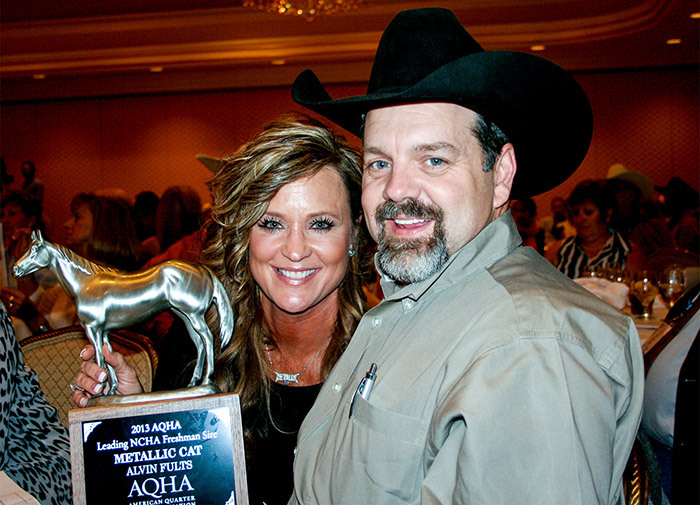 Alvin and Becky Fults grew up with a mutual love of horses in Dumas, Texas – about 50 miles north of Amarillo. Becky enjoyed jumping and running barrels, while Alvin rode rope horses, but the two went their separate ways when they left home for college. After graduating, Alvin and Becky were reunited in Amarillo and they’ve been together ever since. The couple continued to share their equine interest until Alvin’s shoulder was injured in a roping accident in 2002. After taking some time to heal and mourn the loss of the sport he’d always loved, Alvin decided to try his hand at a new event and purchased his first cutting horse in 2004. But by 2008, Alvin and Becky decided to slow down to enjoy family time with sons Colton and Cade, so they sold all but a few of their horses and planned to stick to showing at weekend events. Just then, newly turned professional Beau Galyean and a handsome 3-year-old red roan colt named Metallic Cat changed everything. While Alvin and Becky never planned on being stallion owners, they have happily embraced the responsibility fate has laid on their shoulders as custodians of Metallic Cat. The 2005 stallion enjoys daily turnout in a 12-acre pen, which is surrounded by double-fenced traps with his own band of broodmares. With an on-site breeding facility, “Denver” never leaves the comfort of home and he has become a part of the Fults family. Now deeply involved in the cutting horse industry, the couple resides on their 200-acre Fults Ranch in Amarillo. 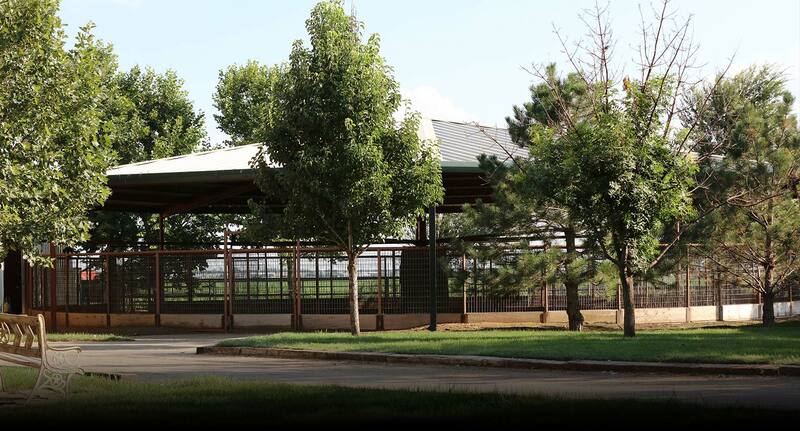 Fults Ranch boasts irrigated alfalfa and grass hay fields, which supply the ranch with quality forage, as well as an assortment of beautiful trees. The homey facility is warm and inviting, and the Fults’s enjoy welcoming visitors to their own little oasis in the desert. In October of 2017, just when things are clipping right along, an opportunity comes along that’s just too good to resist. It was enough to convince Alvin and Becky to cash in their Metallic Cat chips and go home. They sold their beloved stallion and set course in new directions: they’d stay in the business and breed a few mares; they’d realize a nice return on their investment; they’d concentrate on their other projects; and they’d take advantage of all their free time. Truth is, selling Metallic Cat left the Fults feeling the blues and without real purpose in their cutting horse endeavor. Alvin and Becky missed the buzz of the cutting business. They missed the mare owners, the friendships and all the promotional puzzle pieces that go along with standing a stallion. But, most of all, the Fults missed Metallic Cat. So when Alvin and Becky realized they had a chance to purchase the proven son of Metallic Cat, Stevie Rey Von they jumped. Three hours later they were back in the thick of it all – big smiles on their faces and even bigger dreams on their minds. This Amarillo couple is now walking to a new tune with Stevie Rey Von. There’s been an emotional connection for us with that horse from day one. We always loved Miss Ella Rey. She was so great on a cow and so electric, and I knew in my heart that was going to be a good cross. With Stevie being a negative across the board on the AQHA’s five-panel test for genetic diseases, that was also a big factor for us. Being N/N opens the door to more mares and it’s just a hurdle we no longer have to worry about.